To say there’s much going on in the credit card industry is an understatement. Each day, there seems to be news breaking on everything from changes to the financial sector as a whole to new programs being unveiled by the credit card heavyweights. Today, we learn American Express is looking to carve its place in the online payments application – and it’s looking to become major competition for PayPal and Visa. 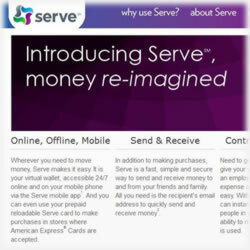 Serve is an electronic wallet that allows consumers to use it by linking a credit card, debit card or checking account for funding purposes. It works in much the same way as Ebay powerhouse PayPal. Customers can easily send money back and forth using their smartphones or the website. Further, AmEx will be sending out plastic cards for those who like to shop face to face and who accept the world’s third largest credit card. American Express is looking to update its image a bit and is looking to attract those consumers who have grown up shopping and paying bills online. This is the one way it can make that happen. Further, it also allows for a stronger competitive edge against other credit card companies and banks. In a press release today, the company addressed the “large cultural shift” that the company is currently undergoing and because of that, it’s now well positioned to become “more of a software and platform based company”. Of course, the fact Visa and MasterCard raked in close to $4 trillion last year just from its debit cards had to have been a strong motivator, as well. All of the research and a $305 million investment led to the purchase of Revolution Money, an internet based payment processor. While many of the strong points associated with the American Express Serve card are similar to those customers already have with PayPal, there are those that set it apart. There are several businesses AmEx has already partnered with that will offer coupons. Once a customer clicks on that coupon, it automatically goes into the Serve network and once the consumer checks out, the coupon is automatically applied. Another smart move is the safety the network offers. Once a customer sets up his Serve account, he won’t be required to continually enter personal information, such as the card number or addresses. Another feature that won’t be available until some point later this year is the ability to send money with just an email. Incorporating a PIN number makes it a breeze for both the sender and receiver. And it’s worldwide. For those who like to withdraw cash, you’ll be happy to know your first cash advance each month is free and all others will be a flat $2 fee. The Serve card will be accepted everywhere American Express is. For now, there are no options for consumers to design their own cards, but the standard card is handsome. The recognizable blue AmEx logo sits handsomely on the card that’s also blue, though in varying shades. As part of an incentive to draw new users, fees usually charged for funding the accounts will be waived for six months. From there, it will compete with PayPal’s pricing schedule and will charge 2.9 percent of any transaction along with thirty cents. One AmEx spokesperson, Joanna Lambert, said there would be no charges for funding the Serve accounts with checking accounts or debit or credit cards. Because Serve is marketed as a debit card and is by nature a prepaid offer, there are none of those frustrating debit card transaction fees that many are beginning to fear. This bodes well for consumers and the companies they do business with. Not only that, but this alone sets the AmEx Serve card apart from traditional competitors. All in all, this looks like formidable opponent that’s just now entered the credit card sector. It’s realistic, will serve a growing need and provides options for those customers who like the convenience PayPal has long since offered. Couple in the ease in which the applications can be installed on the iPhone and Android networks (BlackBerry is expected to be on board shortly), and it’s clear this is a winning idea.